The political representatives of the Ulster Volunteer Force (UVF) have dismissed pressure for the group to fully decommission its weapons as they appointed a new leader last week. The British government has still taken no action against the UVF murder gangs or their political mouthpiece, the Progressive Unionist Party, following the murder of Bobby Moffett on the Shankill Road almost two weeks ago. The murder resulted in the leader of the PUP, Dawn Purvis, being forced to resign her position after complaining of being “severely restricted”. Following an emergency meeting last week, John Kyle has taken the position of interim leader of the PUP. Kyle subsequently admitted that not all of the UVF’s arsenal has been destroyed. The UVF had claimed to have formally decommissioned all of the weapons under their control in June 2009. 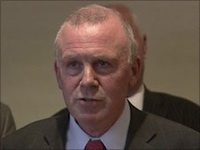 And Derry PUP Chairman, Leslie Mitchell this week backed away from the claims of UVF decommissioning and referred instead to a UVF statement of May 2007, in which the group said it would retain their arms, but that they would be put “beyond the use of normal volunteers” and the weapons would remain under the control of the UVF leadership.